You like the HONEY BEES. Get the lowdown on all you need to know about keeping HONEY BEES and how to do it at a one day introduction. Location Sunshine Coast. QueenBee, Paula West, Apiarist, at AdoptaBeehive will keep you entertained with hands on activities for a day of hammering, wiring, spinning honey, inspecting a beehive, identifying the 3 types of bees and of course there is nothing better than a “Taste Test” of various honeys from the 2017 harvest. We operate as artisan beekeepers. This is a practise that has been sidelined with the advent of industrialization of our food products. Our honey is raw, pure honey, meaning there is no heat treatment processes. Heat kills the major health benefits of the delicate and vital essence of the honey. Also, we do not use antibiotic, chemicals or bee cake. Antibiotics are foreign substances to a bee’s digestive system and the residues are deposited into the honey, wax and propolis, which we then consume! Are you eating antibiotics inadvertently?? Beekeeping is fun. You get plenty of exercise and if you are keen you may be invited to join our Next Generation of young artisan beekeepers, eventually looking after your own bee sanctuary. What is pollination? You will understand why the honey bees are so important to our existence and the simple solutions required in protecting our local fruit and vegetable supplies because the global food shortage is just around the corner. If you are allergic to bees, then this is not for you, unless you are interested in helping out with the maintenance of equipment. Paula West is the Queen Bee/ Apiarist of Adopt a Beehive. www.adoptabeehive.com.au and also owner of Kookaburra Organics. Paula’s approach to beekeeping is totally holistic and natural and she will impart some vital “must know” info about bees, pollination and your veggie garden. Her expertise and comments are regularly sought by media groups. 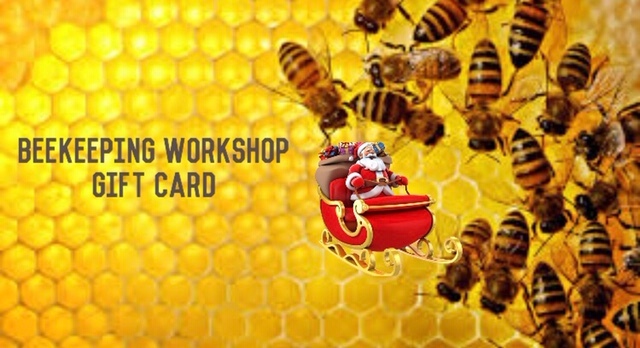 Click the button below to add the Gift Card for BeeKeeping Workshops to your wish list.